OPI Gelcolor by OPI System. GelColor by OPI's shine-intense shades cure in 30 seconds and last for weeks. GelColor by OPI redefines salon gel services with durable, glossy OPI color! STRENGTHEN BASE COAT - GC 011 -.5 Fl oz /15ml. PH Balancing Agent Advanced patented formula. OPI Avojuice Lotion. 1 x Sparkling Mimosa 30 ml. BREAKFAST AT TIFFANY'S 2016. Lotions can be used on both hands and body. We promise we will work with you directly to resolve any issue you may have. OPI Nail Lacquer. 1 x OPI Base Coat for Natural Nail NT T10 15ml/0.5oz. 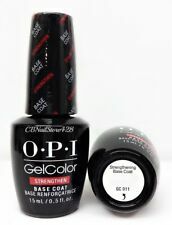 1 x OPI Top Coat NT T30 15ml/0.5oz. We promise we will work with you directly to resolve any issue you may have. Actual Images of the item are shown above.